Waterproof vinyl decking is a must in this area of Spokane Washington and Northwest Idaho. We can help when you are looking for the most trusted name in vinyl decking, roofing, and construction. As a family owned and operated company since 1987, we set the standard for quality workmanship and professionalism in the business of deck construction and roofing. We have built our business by combining our experience, knowledge, and traditional business practices with the latest, leading edge technological advancements in the industry. We take on projects of any size. Whether you need a small patio deck or you are dreaming big, we can bring your vision to life. Along with new deck construction, one of our more popular services is deck resurfacing, including vinyl decking installation. As an authorized dealer and installer of Tufdek™ vinyl, we highly recommend this vinyl decking product thanks to its excellent quality and warranty. Tufdek™ vinyl is a fully waterproof decking material that can also be installed on patios, pool decks, sundecks, balconies, and virtaully any outdoor walkable surface, including roof decks. Tufdek’s 100% watertight seal makes it a perfect choice for your deck flooring needs. Take a look at Tufdek’s online vinyl decking photo gallery to view different installations. We are industry leaders with decades of experience. Every project is given the same high level of service. As well, we only install the best, highest quality products. We bring our clients value with the best roofing, vinyl decking, and construction products on the market. “Every time I have called them they provide prompt, reliable service at an affordable price” – Chris C.
Whether you are building a new deck, resurfacing your old deck, or need waterproofing for your patio, balcony, or any outdoor walkable surface, consider installing Tufdek vinyl decking. 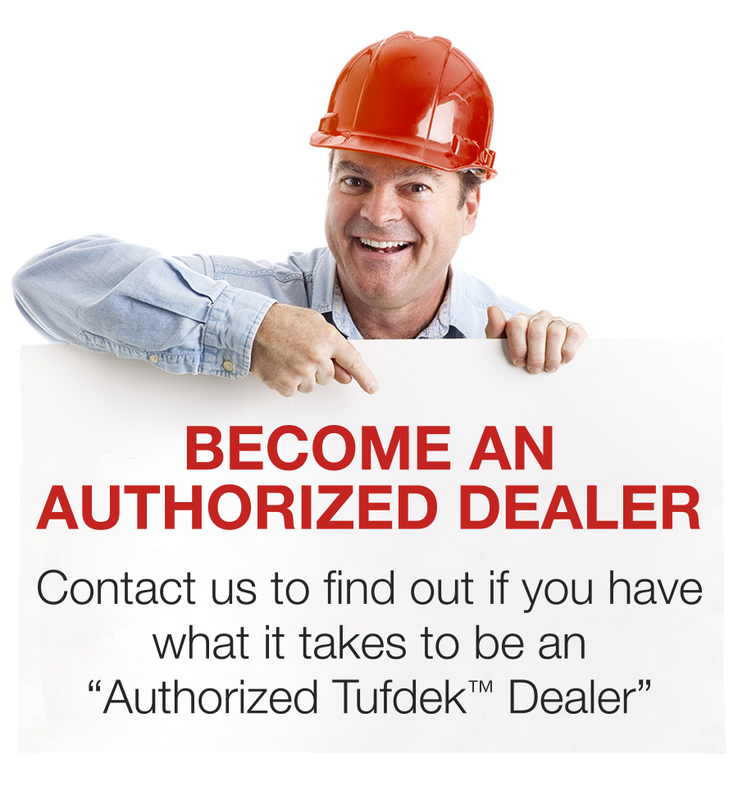 Tufdek offers one of the best warranties in the business. To learn more about this excellent vinyl decking product, watch these videos prepared by Tufdek. If you still have questions, please call the Tufdek office toll free at 1-877-860-9333 or fill out the following online contact form. We look forward to meeting you.